Beautiful, touching and messy. Life Is Strange is goodnot greatbut I'd recommend it to anyone. What is it? A Telltale-style episodic adventure. With time travel. I like Life Is Strange, but it's not that simple. It's an uneven production that lacks consistency across plot, tone and design. It's an episodic adventure game in the Telltale style—the emphasis being on choice and consequence, not puzzles and inventory management. Dontnod's production isn't as polished or well-paced as The Walking Dead, and yet I think I prefer it. There's a lot that Life Is Strange does wrong, but it can be powerfully affecting at its best. You play Max Caulfield, a photography student who returns to her hometown of Arcadia Bay to attend the prestigious Blackwell Academy. Max is shy, loves selfies and retro cameras, and also has the power to rewind time. She learns this latter fact while saving the life of Chloe, a punkish, blue-haired Blackwell dropout. 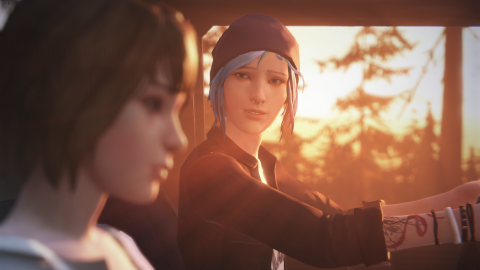 Max and Chloe used to be best friends, but fell out of touch. After the incident, the two reconnect, and Chloe enlists Max's help in searching for her other friend, Rachel, who recently went missing. Arcadia Bay has troubles of its own. A once prosperous fishing town, it's fallen on hard times. It's also beset by a series of weird 'eco-disasters'—everything from snow in the middle of summer, to an unscheduled eclipse. It's heavily implied that these disasters are supernatural and potentially apocalyptic. The students of Blackwell are even planning an "End of the World" party—a metaphor with all the subtlety of a bull smashing into the coming-of-age shelf of a DVD store, a copy of The Rules of Attraction impaled on one horn. As Max navigates through life at Blackwell, she's presented with a number of choices. Upon witnessing the misfortune of a rival, for instance, she can choose to comfort or taunt her. So far, so Telltale, but, thanks to Max's time powers, every decision can be rewritten. It gives you the chance to revel in schadenfreude, then skip back and do the right thing. I found it useful as I was first feeling my way through Max's life and relationships. Over time, I was firmer in my convictions—rarely feeling the need to double back and see the alternative choice play out. It's only possible to rewind within the current scene, meaning, by the time you reach the long-term consequences, the original choice is set in stone. Initially, Max's power feels small-scale. She can control time, but remains as trapped by it as everybody else. There are a few puzzles in Life Is Strange, and the best of them use Max's rewind in interesting ways. These interactions act as welcome pace breakers from the drama, but do occasionally tip towards padding and busywork. At one point, in episode two, Max is forced to hunt down a series of empty bottles in a junkyard. It's a sequence so tedious that it earns a self-deprecating reference in a later chapter. The story is part character drama, part detective mystery, part sci-fi adventure. It's in trying to balance these three strands that Life Is Strange most frequently stumbles. In one episode, Max must search a character's room for clues. The character in question is sat in the room, inwardly crying over the despair of recent events. In the situation, it feels weird to be in detective mode—the game undercutting its drama for mystery, even as the mystery attempts to set up a greater drama. It's difficult to pick apart these faults here without spoiling things. Needless to say, the tone is sometimes incongruous. Life Is Strange is at its best when focusing on the characters. Initially archetypes, each gains depth and motivation as the story moves forward. Max's enemies have vulnerabilities, and her allies flaws. At times, the game is pointed in its observation. Warren, ostensibly a close friend, is a clingy Nice Guy™-lite, whose constant, desperate bids for affection made me want to cringe my skin off. While the dialogue doesn't always do the characters service (do teens still say "hella"? ), the voice acting is consistently strong. Max and Chloe are particularly stand out. Their shifting, strengthening relationship underpins the game's best moments. There's a quiet beauty to Life Is Strange that is a big part of the reason it's stuck with me since the first episode. For all its missteps, the atmosphere it creates is pitch perfect. It looks gorgeous – rendered in a painterly, hyperreal style that seems to effortlessly create memorable moments. Images as simple as Max sitting contemplatively in someone's kitchen can feel poignant and vulnerable. The soundtrack is excellent, too – the acoustic score accompanied by licensed tracks from Mogwai, Amanda Palmer, the Foals and similar. Life Is Strange feels like it should be quirky, or arch, or featuring a cameo appearance by Greta Gerwig. Instead, it's unfocused but earnest. It's a brilliant attempt at progressing and improving Telltale's familiar style, even as it's not, in and of itself, brilliant. I could nitpick multiple problems with the plot and pacing, but Life Is Strange nonetheless remains one of my favourite games of the year.